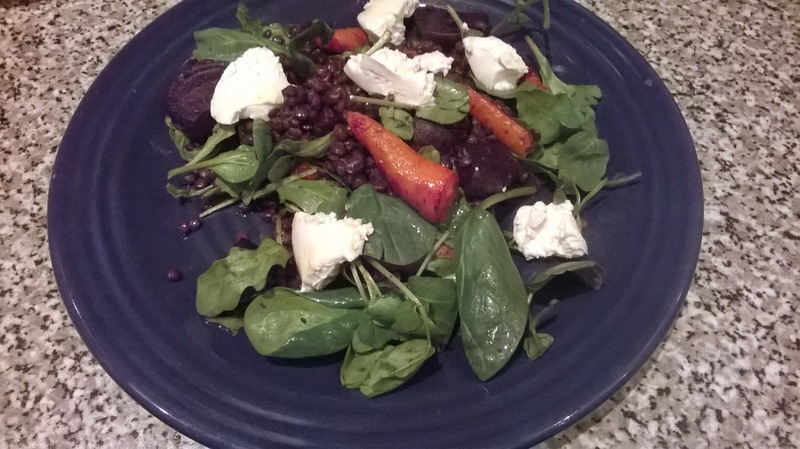 This salad is much easier to make than it initially looks. Just pop the vegetables in the oven to roast as soon as you get in, do whatever else you need to do around the house – help the kids with their homework, do the ironing, sit and have a large glass of wine – and then throw the rest of the components of the salad together when the veg is almost ready. I used ready-to-go pouches of lentils which, although more expensive than the dried variety, are extremely fast to heat through with none of the time consuming soaking and I’m sure they’re just as healthy. This will feed at least four hungry people – increase the amount of veg or lentils and it’ll go much further! You could also substitute the veg being roasted, you could use courgette, aubergines, anything which roasts well. Don’t use potatoes though. 1. Put the carrots and beetroot in an oven proof dish with 1 tablespoon of olive oil and put in the oven at about 190 degrees for 30-40 minutes, or until soft. 2. Cook the lentils according to packet instructions – either on the hob or in the microwave – and transfer to a large bowl. 3. Tip in the cooked veg and watercress and mix well. Season. 4. Pour the remaining olive oil, lemon juice and honey into a small bowl and whisk. Taste and add more lemon or honey if needed. Season. 5. Serve a helping of the lentil salad, top with dollops of lovely goats’ cheese and drizzle over the honey dressing. A little will go a long way! Next Article The Reason I Could Never Be Vegetarian – Chorizo!